A team of Penn Manor High School students was among the top three finishers in the “Governor’s Jobs First Regional STEM Competition,” held Feb. 14 at Lancaster Lebanon Intermediate Unit 13. The regional STEM (science, technology, engineering and math) competition challenged students to design and build a prototype product that would enhance the local community. Teams from 10 schools participated in the competition. The Penn Manor team created a prototype of an automated fire barrier designed to be hard-wired to a smoke detector. When the device detects smoke, it automatically deploys a fire blanket that drops down to block a door opening, limiting the spread of smoke and flames. Members of the Penn Manor STEM team include juniors Joshua Adams, Calle MacDonald and Kevin Ward; sophomore Ryan Mahoney; and freshman Cole Yecker. Kudos to the team for developing this potentially life-saving device! 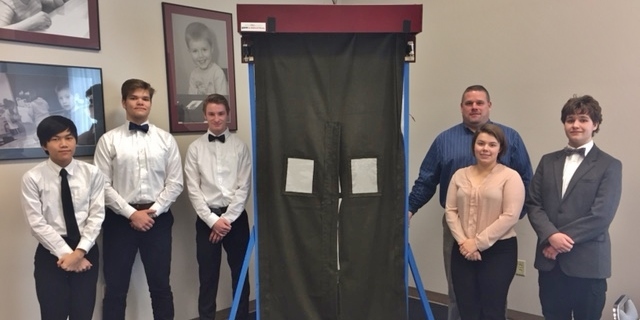 Members of the PMHS STEM team, from left, Kevin Ward, Ryan Mahoney, Cole Yecker, Calle MacDonald, Joshua Adams and teacher Barry Groff pose with the fire barrier prototype.